Back again for a Design On A Dime Monday! 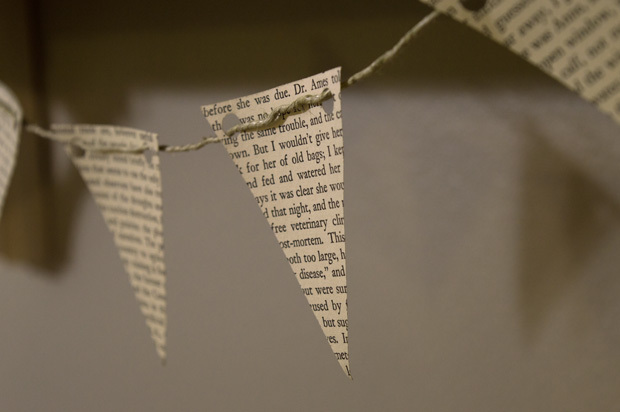 I love all things with old books, so I wanted to create these little pendant banners out of old book pages. There’s something about that yellowed thick sheet that gives my heart flutters. It looks great on a small shelf or along a fireplace mantel. Check out how simple this banner is below. 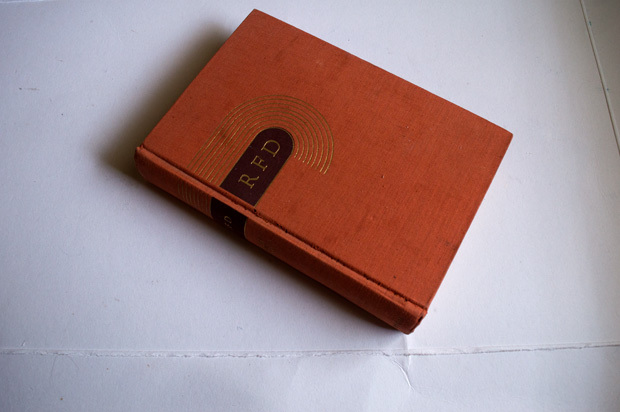 I started out by drawing the design on my book page. There are multiple pendant designs you can choose from. I went with a simple and small triangle. 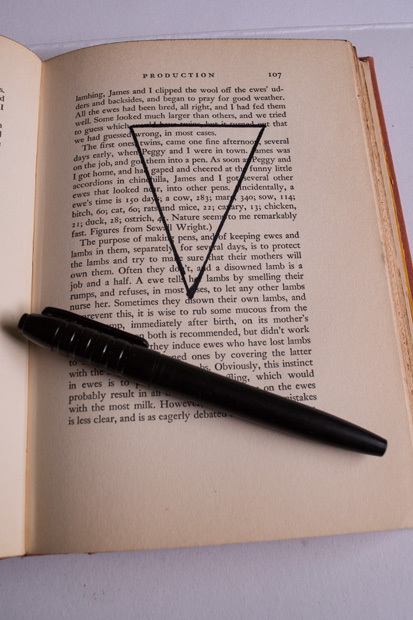 You can easily use a ruler to make the shape or print a pendant design in Word and cut it out for a stencil. Once I figured out the number I would need, I cut them all out. 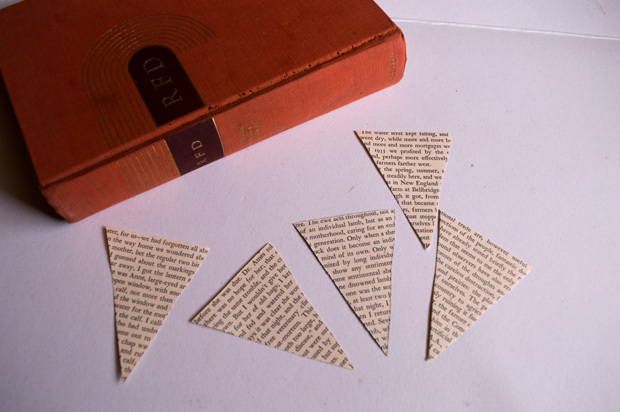 Try to squeeze as many onto a page as possible (unlike I did here) so that you don’t waste those precious yellowed pages. Use a hole punch to punch holes in the top corners and thread your rope or jute through the pendants. Tada! That was it. 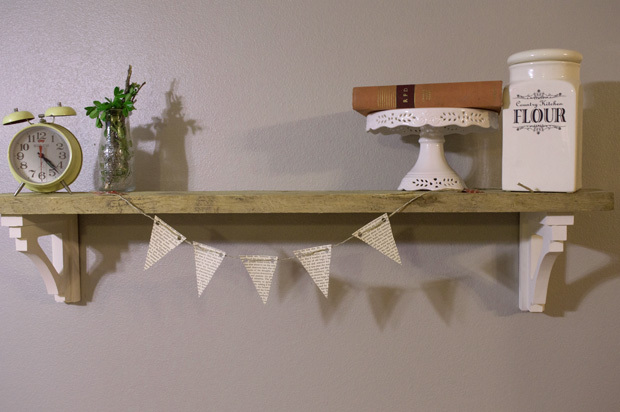 So easy and simple and I love the vintage look it gives this shelf. Update: I still use this banner today. It is the perfect farmhouse accent for any shelf. Some of the pages have torn where I hole punched them. I simply used a piece of scotch tape along the tear and hole punched it again through the tape. I really hope you enjoyed this pendant banner project from my early blogging days. It is one of my most popular DIY’s to date. I would love to see how you have recreated this look. If you want more banner ideas, check out this watercolor dipped banner, this Wooden-Heart Garland, and this easter banner. If farmhouse style is up your ally, I would love it if you signed up for my newsletter below! You will gain access to The Barn, my exclusive storage area for all things farmhouse printables. It’s totally free so check it out.